THE coal and power ministries are engaged in a tug of war with the Union Ministry of Environment and Forests (MoEF) over mining rights in forest areas. 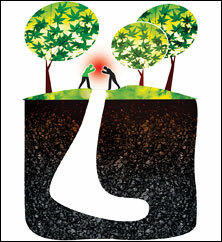 On May 28, the MoEF released the first set in a series of maps of coalfields superimposed over forests on its website. It showed 35 per cent area of nine coalfields in six states including Chhattigarh, Jharkhand and Orissa are ‘no-go’ areas—dense forests that are out of bounds for mining. The remaining 65 per cent of the coalfields are in forests that can be mined, but only if environmental and forest clearances are obtained. Steel, power and cement projects linked to these coal blocks have been hit by MoEF’s move to make forest clearances transparent. The Union power and coal ministries are alarmed by the declaration of no-go areas as an estimated 267 billion tonnes of coal reserves are under dense forests, and if the prime minister’s planned eight per cent growth is to be achieved, these mines would have to be unlocked. Coal production would have to be doubled in the next seven to eight years, especially to fuel the proposed ultra mega power projects (UMPPs) of 4,000 MW and above. The power projects in various states are covered by the 11th Five-Year Plan to meet additional power production target of 78,577 MW by 2012. So far, only 23,000 MW generation capacity has been added under the current plan period. The coal production in 2009-2010 was only 532 million tonnes as against a demand of 604 million tonnes. 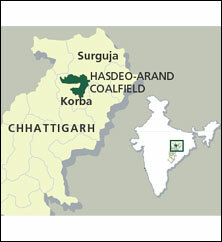 While environmentalists see the declaration of no-go areas as a progressive step to balance ecology and development, the power and coal ministries are worried, particularly over the fate of the Hasdeo-Arand coalfield (see map) in Chhattisgarh where most of the allotted coal blocks are in moderately to densely forested areas. The coal blocks here will support 20 steel, power and cement projects, including a UMPP requiring investment of Rs 20,000 crore. The coalfield has 5 billion tonnes of coal reserves; 18 blocks in it with projected capacity of 120 million tonnes per annum can support thermal production of 20,000 MW. Union coal minister Shri Prakash Jaiswal said mining these coal blocks is vital for meeting the current five-year plan target as 70 per cent of India’s power production is coal-fired. The Chhattisgarh government has delayed bidding for its UMPP and has appealed to the prime minister to intervene saying a lot of time and energy has been spent on planning the projects linked to the coal field. Gujarat chief minister Narendra Modi also appealed to the prime minister to free the coal blocks; the power and coal ministries too sent urgent letters. R Sreedhar, geologist working with the consortium of non-profits, Mines Mineral and People, said MoEF’s progressive measure may get undone as pressure from the commercial lobby backed by the prime minister’s office (PMO) is building pressure on the environment ministry. T K A Nair, principal secretary to the prime minister, has written to the MoEF saying the PMO does not agree with the definition of no-go areas. In a subsequent meeting called by the PMO, the coal minister asked minister of state for environment and forests Jairam Ramesh to allow coal mining in 30 per cent more areas. In a press statement on May 31, Ramesh said releasing more than 5 per cent dense forests could not be justified ecologically. “Most coal mines in the no-go areas will have to be developed as several thousands of crores worth investments in the power and steel sector are dependent on the already allotted coal blocks. Some relaxation will be granted,” a PMO source said. It is learnt another meeting is scheduled in the PMO in June-end. Jaiswal said his ministry will not cancel any project but would not “allot more coal blocks till all coalfields in the country are mapped.” The PMO has formed an inter-ministerial group to ensure all environmental and forest clearances are given before auctioning of allotted coal blocks to industries. The coal ministry is waiting for the amended mines and minerals development and regulation bill to be introduced in the next Parliament session that allows competitive bidding for the allotted coal blocks by private steel, power and cement companies that wish to set up captive power plants. The mapping of other coal fields, a joint exercise of the MoEF and ministry of coal, continues. Could you let us know if these go and no go area maps are publicly available? I tried searching at several places, but couldn't find them. Can I get a list of NOGO blocks finalised sp far.